And This Video Will Prove It To You! By watching this whiteboard presentation, you will learn how you can save over $789 on traditional treatment methods for tennis elbow and avoid the mistakes that I made that only made my elbow pain worse! 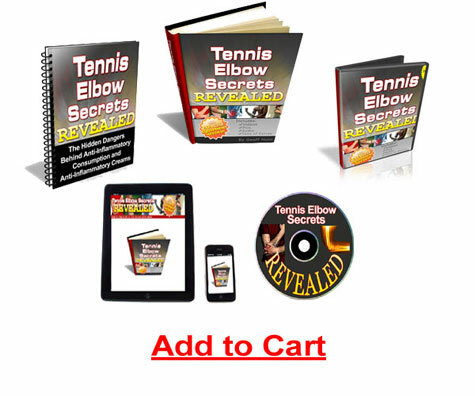 If you are someone who likes to learn by doing, then these must see tennis elbow pain relieving video tutorials, show you how to cut your recovery time by 70 percent and jump start the healing process. STOP Your Tennis Elbow Pain ... START TODAY! When you are serious about finally putting your elbow pain behind you and getting back to all your favorite sports, hobbies or past times - learn this proven, fail-proof formula that Physical Therapists don't want you to know! You don't have to call your Doctor's office and wait for days or even weeks for an appointment. You will finally get a good nights sleep each and every night without worrying about elbow pain as you change positions in bed. You will lift your child or Grand-kid with confidence without worrying about whether you'll drop them because of your elbow pain. Because the easy to follow treatment guide and step-by-step online video tutorials are delivered digitally, you can get started right now even if it's 4 in the morning! You'll be able to accelerate in your favorite sport or strength training without being held back because of forearm or elbow pain. Printable exercise journal and workout logs for every single day...every single routine...every single level! This is literally as easy as painting-by-numbers! I've done ALL the work for you (short of actually performing the techniques of course ;-)! As I mentioned before, it's not just about knowing what exercises you have to do. It's about making sure you do those exercises right. Like any exercise routine, it's important to make sure you're right on track and doing the specific exercises you're supposed to do. This specialized treatment journal will not only give you a place to record and follow your progress, but it will give you a simple cheat sheet with all the exercises you're doing and how many recommended repetitions you should do. With these incredible "Print & Follow " Exercise Plans I've done practically ALL the work for you! Motivation is important. And while I think the idea of getting rid of the pain and inflammation once and for all is good enough motivation, I wanted to give you an extra boost as well. I interviewed a recent success story of Tennis Elbow Secrets Revealed and got them to talk about their personal process with the treatment plan and what insights they would have for anybody new to the treatment program. No gaps were left unfilled as we covered over 60 MINUTES of treatment advice on how to return to all you favorite sports, passions, hobbies that you thought you would have to give up on. In my time in the world of health and fitness, I've heard a lot of false information about the good and the bad of anti-inflammatory pills. And when it comes to treating your injury, much of this false information can lead to significant setbacks for your treatment. In this short and concise guide, I lay down the facts that every sufferer must know about what these pills can do to you and your progress. The truth of the matter is that anti-inflammatories are only a "band-aid solution" that only give you temporary relief from your pain but do nothing to address and treat the root cause. Continous daily consumption could be making your injury even worse! You Are Fully Protected By A 365 Day Money Back Guarantee! That's what's called a true money-back guarantee. You get 365 days to put this program to the test! If you're not 100% satisfied, I don't want your money. Just shoot me an email and attach your online journal as proof you've given our elbow treatment system a try and I'll promptly send you a complete refund, no hassles, no questions asked. Just imagine how nice it would be if you had this kind of guarantee when you went to a Doctor or a Physical therapist! So now is your time to act. And your getting everything absolutely risk-free: backed by my 365 day, 100% no-hassle, no-questions-asked, money-back guarantee. If you've suffered from tennis elbow for even a fraction of the time I have... if you've spent hundreds of dollars on "treatments" that don't have the same risk-free investment you're getting here... you know how rare an opportunity this is. P.S. Take it from someone who suffered from tennis elbow for 7 years and spent over $780 on so called 'traditional' tennis elbow treatment methods such as doctors, physical therapy, massage therapy, acupuncture, braces, messy transdermal, anti-inflammatory creams and medical gadgets. None of it worked. It was only after I used my 15+ years of experience as a specialized fitness trainer to find the cure for my own tennis elbow that I finally put a stop to the harsh pain, the crippling condition and the needless spending. Now you get to take advantage of a treatment that took me a good amount of trial and error to discover. P.P.S. And don't forget about the limited-time $155 deluxe upgrade. Not only are you getting a thorough, step-by-step, easy-to-follow treatment guide with clear instructional graphics... but you're now getting 5 instructional videos that will show you EXACTLY how to perform each exercise so there's absolutely no risk of doing it incorrectly... plus the Personalized Online Treatment Journal, the 60 Minute Audio interview, and the Guide to the Dangers of Daily Anti-inflammatory Pills... absolutely free. And with a 100% no-questions-asked, 365 day money-back guarantee, you have no risk whatsoever. A life free from the pain of tennis elbow is right in front of you, but you must act now if you want it. Copyright ©2017 Tenniselbowtips.com. All Rights Reserved.